How Can A Referral Management Software Compliment An EHR/EMR To Achieve A Highly Performing Referral Network? Managing patient referrals is a laborious process for large enterprise hospitals. These large multi-specialty set-ups are joint ventures or mergers or acquisitions. The bigger the network, the more complex is their referral process. So these hospitals are relying on computers and customized software to make sure their productivity and patients’ well-being. In the field of medicine, we need computerization to manage the enormous volume of data that these large enterprise hospitals create and store for each patient. EHR software saves practices time and money, as well as helps them communicate instantly with insurers, hospitals, and referring physicians. Using referral management software with EHR/EMR enables communication between different care providers on patient demographics, diagnostic reports, test results and any sensitive information. Electronic Health Records (EHR) are digitized forms of patient’s chart data. EHRs are real-time, patient-centered records that make information available instantly and securely to authorized users. An EHR has the patient’s clinical data including demographics, progress notes, problems, medications, vital signs, past medical history, immunizations, laboratory data and radiology reports over time. Financial Incentives – Medical providers who convert patient records into electronic ones get financial incentives from CMS. Speedy process – With an EHR system, doctors can immediately place orders for imaging or laboratory work. This reduces errors because a doctor’s handwriting is difficult to decipher. 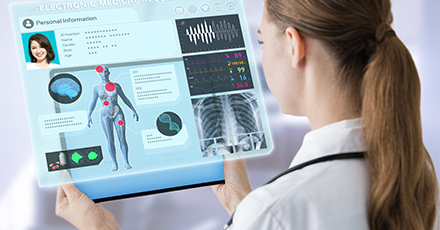 Unlimited access to medical records – With the help of a patient portal connected to the EHR system, both patient and provider can get access to medical records very easily. Easy management of patient data – As mentioned earlier, Electronic Health Records (EHR) are digitized forms of patient’s chart data. It helps is managing all patient-related information like medications, vitals, diagnostic reports, medical history, etc. e-messaging between providers – In order to attest referral information, telephone tag between providers is common. It is a time-consuming process. With EHR software, physicians can e-message across practices. One situation that benefits in particular from e-messaging is referrals. Rather than playing telephone tag to get an appointment scheduled, the physician electronically sends a message to schedule the appointment. Why is a Referral Management Software is needed in addition to an EHR/EMR? Large Enterprise hospitals have implemented an EHR/EMR system because it helps them manage their patient data securely. Providers face difficulties in managing paper-based patient records. So EHR implementation is indeed a boon to them. Yes, indeed EHR/EMRs are doing a great job but are they doing enough for patient referral management? What are the challenges enterprise hospitals face in their referral management even after implementing an EHR/EMR software? Insurance pre-authorization – The process of waiting for the insurance company to respond and approve the procedures or medication is time-consuming. If this process is automated it would save time and efforts of providers, insurance companies, and patients. Communication between EHR/EMRs – EHRs can communicate only with EHRs within the same network. Sending patient and referral information to providers who do not use the same EHR is complicated. Patient Referral Leakage – When a PCP refers the patient out-of-network, it leads to referral leakage. PCP can avoid patient referral leakage if the patient is referred to within the network. When that is difficult, patient referral leakage is inevitable. If the patient is referred out-of-network and is not happy with the care given, the chances of the patient coming back to the PCP is less. Referral leakage causes revenue loss and patient dissatisfaction. Referral Analytics – As a large number of referrals flow in and out of the network, it is difficult to track the exact number. It is also tedious to track the number of referrals in various status and to close referral loops. Referral updates and referral loop closure – When PCP refers patients out-of-network, the chances of getting referral updates are minimal. The specialist is usually busy and does not update the referring provider about the referral. Referral updates are crucial in closing referral loops. How can a Patient Referral Management Referral Management work in cohesion with an EMR/EHR system? How great it would be if a Patient Referral Management software could integrate seamlessly with an EMR/EHR system? It can help in ensuring end-to-end Patient Referral Management without disturbing the existing system. Insurance pre-authorization – HealthViewX solution supports automated insurance pre-authorization that reduces the manual work of the referral coordinators. It will save a lot of time for the hospitals. Intelligent Provider Match – The solution supports an “Intelligent Provider Match” Feature that helps in finding the right specialist/imaging center easily. With this feature, it is easy to find a receiving provider within the network. It will reduce the patient referral leakage. Referral Timeline – In HealthViewX Referral Management System, any referral has a timeline, to capture and notify the progress of the referral to all the stakeholders. A referral will be mapped to a status which helps in tracking it better. For e.g. – If a patient does not show up for the appointment, the status of the referral can be changed to no-show and a reason can also be given. With the help of a referral timeline, the referring provider can track referrals, share information and seamlessly communicate with the receiving provider. Data Management – The solution is HIPAA compliant and enables secure data exchange of all patient-related documents. Seamless Integration – The solution can seamlessly integrate with any EMR/EHR/RIS or Third Party application thus providing minimal disruption in the existing referral flow. Referral Data Analytics – Referral data-centric dashboard gives complete data about the number of referrals flowing out, the number of referrals in various status, patient follow-ups, etc. HealthViewX Referral Management solution helps in building a secure referral network in no time. We can seamlessly integrate with the existing EHR/EMR system and add value to the system by solving major challenges. Our expert team will guide you in changing to a Patient Referral Management Software with minimal effort. Schedule a demo with us to know more about our solution. This entry was posted in blog, Referral Management and tagged medical referrals, patient specific, referral management, referrals on December 5, 2018 by Helena Nancy.